Arrive in Yangon where you will be welcomed by your local tour guide and visit the magnificent Shwedagon Pagoda of Rudyard Kipling fame and one of Myanmar’s most sacred places. The massive bell shaped stupa is plated with gold and the tip of the stupa is set with diamonds, rubies, sapphires and topaz – a stunning sight as the sun sets and a most fitting place to begin our trip in this “GoldenLand”. Then transfer to airport to fly Heho. Arrive at Heho airport drive to Kalaw. Overnight at the hotel in Kalaw. After breakfast at hotel, Transfer Visit through scenic country side to Kalaw, another hill station filled with interesting architecture. Depending on the time, we can wander through the market or ride around the city looking at the decaying colonial mansions. Then biking to Pindaya on a road flanked by beautifully manicured fields where much of Myanmar’s product comes from. Visit Pindaya Cave & Market. Lunch at the local restaunrant and cycling to Inle Lake catch the sunset from the lake side.Overnight at the hotel in Inle lake. 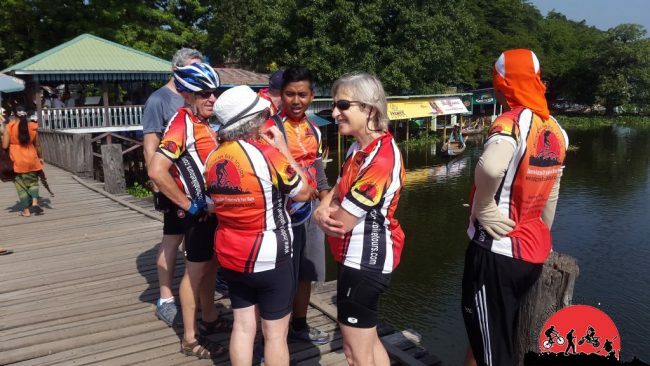 After breakfast, start biking to Inle Lake Region. Biking to Vine Yard and taste wine testing. Then cycling around the villages in Inle Lake. Then you will see the unique method locals use to row their boats, fishermen with their own style of fishing, floating farms and gardens and a handloom weaving cottage with its own showroom. You will visit Phaungdawoo Pagoda which houses the five most revered Buddha Images in the southern ShanState. Alternatively, you may bike to nearby villages to explore more on your own. After breakfast transfer to airport to fly back Yangon. Arrive at Yangon meet and sightseeing Yangon, shopping, and packing our bicycles. Visit the landmark of Myanmar/Yangon in the morning. A walk through “downtown” Yangon, a diverse mix of faded colonial architecture from the British times, and high-rises built by more recent investors; Sule Pagoda, built in the early 3rd century is a landmark in the city centre. Do your last minute souvenir shopping at Bogyoke Market . Evening transfer to airport for international departure.